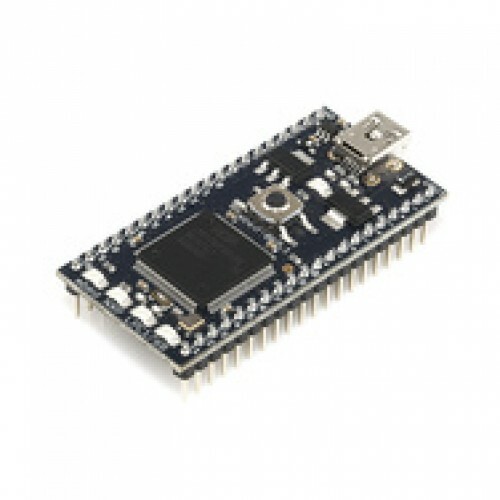 The mbed Microcontroller is an ARM processor, a comprehensive set of peripherals and a USB programming and communication interface provided in a small and practical DIP package. The mbed is a super-easy-to-use rapid prototyping tool built on industry standard technology. The mbed Microcontroller is made for prototyping, and comes in a 40-pin 0.1" pitch DIP form-factor so it's ideal for experimenting on breadboards, stripboards and PCBs. It supports lots of interfaces including USB, SPI, I2C CAN, ethernet, and serial. And downloading programs is as simple as using a USB Flash Drive. Plug it in, drop on your program binary, and you're up and running! The compiler is web-based, so it works on Mac, Windows, and Linux, and it allows you to write programs in C++. You'll also have access to the mbed libraries, which give you an API-driven approach to using the many functions of the microcontroller.